This page includes The Club News columns from the 2000 issues of Across the Fence Post. The Fond du Lac Stamp Club has announced that FONDYPEX 2000 will be held on Saturday, September 9. Although this traditionally has been the WALCOPEX (Lake Geneva) show weekend, the Walworth Stamp Club recently requested a move to later in fall. WALCOPEX 2000, therefore, will be held on November 4. WISCOPEX 2000 will honor the State Historical Society of Wisconsin Library, located in Madison. The library has an extensive holding of philatelic literature. Charles Shoemaker will serve as Exhibits Chairman. For a prospectus and exhibit entry form, contact Charles at: 209 Shiloh Dr., Madison, WI 53705, phone (608) 827-6048, or e-mail kenjico@gchorus.net. Milwaukee-area clubs will hold their 14th annual Distinguished Philatelist Appreciation Dinner on March 19, 2000. This year's honoree is Robert J. Mother. Bob has repeatedly supported the hobby of stamp collecting both in the Milwaukee area and statewide. In 1993, he was inducted into the Wisconsin Philatelic Hall of Fame. The Waukesha County Philatelic Society with Kurt Albrecht serving as Advisory Committee chairman hosts the 2000 event. We thank Vern Witt for stepping in to replace Jim Maher as a WISCOPEX 2000 exhibits judge. Unfortunately, Jim's unexpected hip surgery will put him in the recuperation process at the time of the show. Exhibit entries are due March 15. Get your entry forms now. Contact: Charles Shoemaker, 209 Shiloh Dr., Madison, WI 53705, phone (608) 827-6048, or e-mail kanji@chorus. net. Special show features include a display of a REAL copy of the Inverted Jenny and a booth with Richard Bye and his amazing stamp carvings. You'll also want to attend Bill Robinson's Sunday afternoon auction. The show paid tribute to the 125th anniversary of the first all-mail train in the U.S. with a cover depicting an old print showing a railroad mail train being loaded. To mail order, send a No, 10 SASE plus $1.75 each to: Kenosha Stamp and Cover Club, P.O. Box 1524, Kenosha, WI 53141. When attending MILCOPEX 2000 (September 15-17), keep in mind that although the show's general location is the same as usual, this year's event will be held in the South Exhibit Hall rather than in the Youth Center Building. Enter the Wisconsin State Fair Park via Gate 2 at South 84th Street and West Greenfield Avenue. A set of three multicolored postcards was produced to commemorate the 2000 event. The cards feature Pope John Paul II and mark the pope's 80th birthday through recent Polish stamps engraved by Czeslaw Slania. To order the set of three postcards, send $2.50 and a SASE to: Polish American Stamp Club, P.O. Box 1920, Milwaukee, WI 53201. Make checks payable to the club. On June 17, Verna Shackleton, of Appleton, WI, received the Collectors of Religion on Stamps Founders Award, which honors achievement in religious philately. 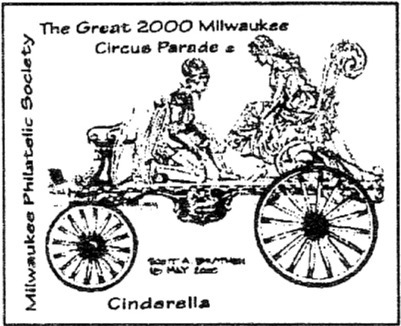 The Cinderella circus wagon is featured on the multicolored cachet of MPS's 2000 circus parade cover. Covers were canceled each day of the parade celebration with a pictorial seal postmark. The celebration was held July 13-16 at the lakefront Veterans Park show grounds. MPS has issued circus parade covers for each year 1971-73 and 1985-2000. Cost of the 2000 cover is $2 each or $6 for a set of four. Send orders to; MPS Circus Covers, P.O. Box 1980, Milwaukee, WI 53201-1980. Make checks payable to MPS and include a No. 10 SASE. In June, Gary Wentworth became the newest member of the JSC's Hall of Fame. The honor is bestowed on members for outstanding service to the club and efforts in promoting philately. The group's current president, Earl Button, is writing a column that regularly appears in Global Stamp News. MPS is offering its limited remaining supply of Bureau of Engraving and Printing souvenir cards specially produced for MILCOPEX 2000 banquet attendees. 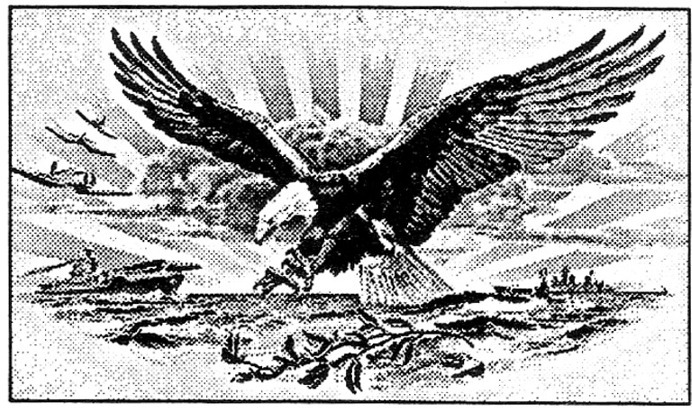 The engraved vignette reflects naval preparedness with an eagle image to complement the military postal history theme of the show. Cards are overprinted with red lettering and postmarked September 16. For further information about this offer, contact: MPS, P.O. Box 1980, Milwaukee, WI 53201-1980.